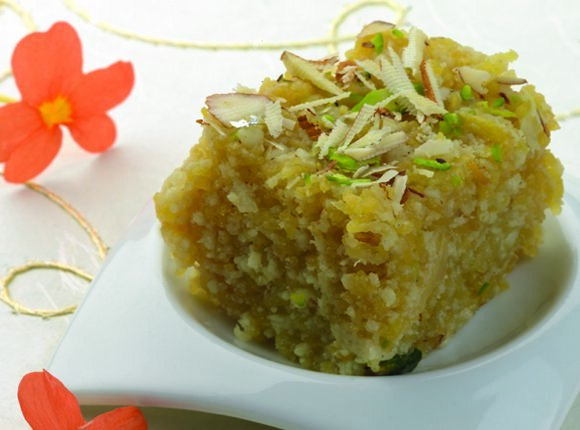 A Sindhi favourite, Singhar ji Mithai as it is traditionally known, is popular with just about everyone else as well. Cook the sugar with one and a half cups of water in a non-stick pan, stirring till the sugar melts. Add the milk, collect the scum which rises to the surface with a ladle, and discard. Add the food colour and mix. Lower the heat and add the sev. Mix gently so that the sev does not get mashed. Add the khoya and mix. Add the milk and cook till the mixture thickens. Add the rose essence and mix. Add half the pistachios, almonds and cashew nuts, and mix gently. Grease a six-by-eight-inch aluminium tray and pour the mixture into it. Level the surface and sprinkle the remaining pistachios, almonds and cashew nuts. Set aside to cool. When completely cold, cut into squares and serve.